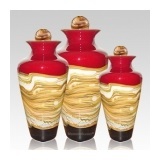 Any quick search for cremation urns for sale will show that a large variety of urn sizes are available. Containers ranging from 15 cubic inches in capacity to more than 700 cubic inches can be readily found from retailers. And many urn styles can be purchased in multiple sizes. Much as is the case with clothing, one size of cremation urn simply does not fit all. This fact about buying cremation urns can lead to much confusion for those who are trying to memorialize a loved one in a fitting with with an ash vessel. Below are some answers to common questions about urn sizes and how to determine what size you will need. Is there a standard size for an urn? Individual urns are typically between 150 cubic inches to 300 cubic inches. These urns are perhaps the most common, and usually have an overall average size of 200 cubic inches. They are usually used for storing the cremation remains of a single person. Companion urns are typically 350 cubic inches to more than 700. These urns are usually used for storing the cremation remains of two people or more people. What is a good rule of thumb for determining what size I’ll need? Generally speaking, to know what size cremation urn you will need, simply refer to the weight of the deceased. In most cases, the cremation process yield about 1 cubic inch of ashes for each pound that a person weights. So, in general, if your loved one weighted, say, 200 pounds at the time of death, you will need a 200 cubic inch cremation urn. It should be noted that memorial industry experts rely upon this rule of thumb because it generally provides a conservative estimate. While it is not a perfect tool, following this rule will rarely result in your purchasing a cremation urn that is too small. A perfectly precise measurement of the remains of a 200 pound person might very well show 180 cubic inches, but only very rarely will it amount to more than 200 cubic inches. When might I need to have a more precise measurement of cremation ashes? Only in very rare cases will a precise measurement of cremation ashes be necessary. These cases mostly involve bodies that are near, or over, 300 pounds. Typically, the largest individual size urns are 300 cubic inches, and families wanting to be absolutely sure that all of their loved one’s remains will fit into the largest individual sizes urns may desire a precise measurement. (But, even these cases, that may not be necessary. Many memorial options are available to these families, including purchasing a companion sized urn or one or more keepsake urns in which to store remains that will not fit into an individual urn.) If a precise measurement of ashes is needed and desired, it is recommended that families inform their funeral director in advance of the cremation he or she is arranging. If you have received the ashes in a temporary container, simply multiply the length of the container (in inches) by the width, then multiple that product by the depth, and you will arrive at the number of cubic inches you will need in the final urn that you will purchase. (Please note that it is perfectly acceptable, and quite common, to purchase an urn that is much larger than what you will need. Extra space in an urn offers no trouble for the remains.) Unfortunately, it is impossible to arrive at a precise measurement of ashes before a cremation has taken place. This is the main reason why memorial industry experts rely so heavily upon the rule of thumb mentioned above. What should I do if I buy the wrong size urn? If you discover that you have purchased the wrong size urn for your loved-one’s cremation ashes, there are plenty of options available. Unfortunately, one of these options is not to return to your retailer an urn that has already been filled. (Many laws and most retailer policies strictly prohibit this.) But, if you have not yet filled the urn, most reputable retailers will be happy to work with you to get an urn that is large enough for your needs. Other options are to scatter left over ashes in some special place or to share the ashes with several people in a family buy purchasing other, smaller, cremation urns or, perhaps, even a few pieces of cremation jewelry.